i added the new NiK collection by DXO to my affinity and it's not working, it keeps loading with no progress till i force shutdown affinity. Is there any solution for that matter? Take a snapshot of the Preferences Plugin tab. What image format are you using and what size is the image? 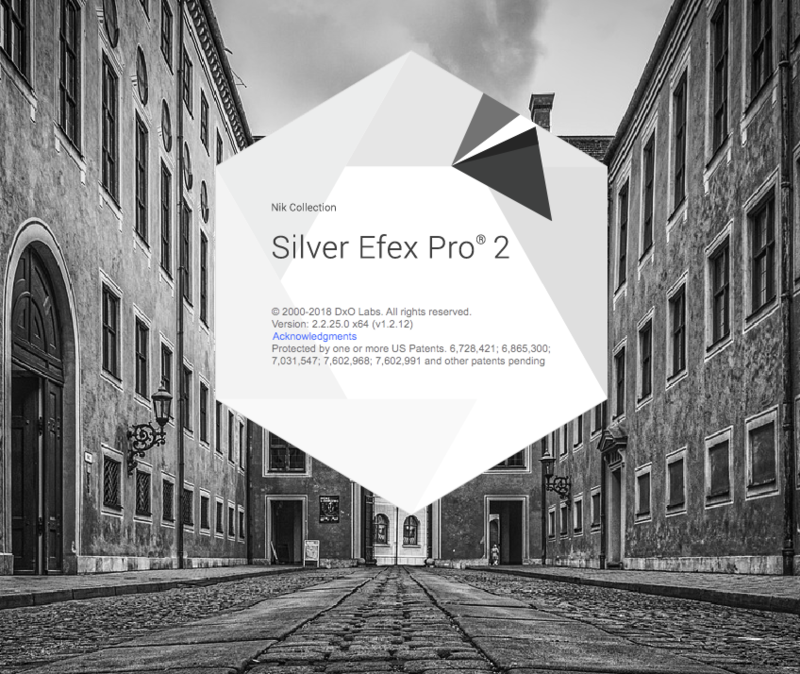 image format: tif "exported from light room"
Have you tried doing it this way: https://petapixel.com/2017/12/15/can-run-nik-collection-plugins-standalone-apps-heres/ because I think they would be better installed to the Applications folder. I kept the old plugins folder from Google that was in the Default Folder, but replaced the NIK Collection by the new one. 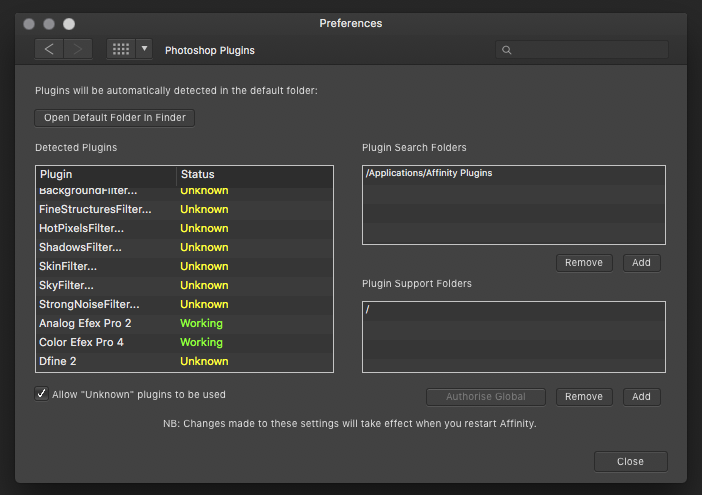 Now the old plugins start the new tools, works fine on my Mac. The new tools did not seem to be able to be installed into a directory of my liking, but only as plugins for specific apps (none of which I have). Edit: No, sorry, you are completely correct. I have the same effect ... now looking into it. I've been playing with all morning, trying colour effect, silver effect, sharpener pro and analog without any issues from AP. 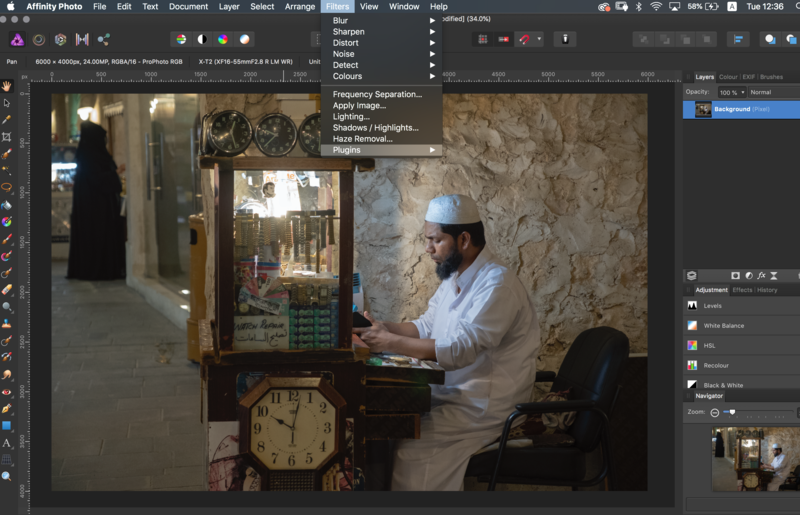 i uninstalled the old version from the uninstaller in app/nik collection folder (MAC) and install the new dxo nik, now all the presets I had made are back when using nik collection. haven't touch any old folders or setting in AP. 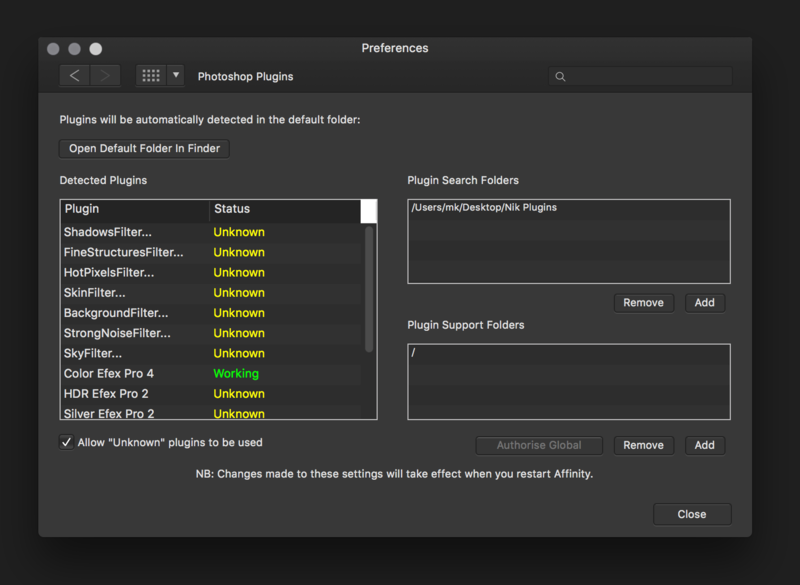 the first time I installed the new dxo nik I did not uninstall the old first and noticed that all presets were gone. i added them manually after installing the old free Nik and just the googe folder for the plugin search, haven’t changed anything to that before installing the new Nik. I did used the authorized global otherwise they were not working with AP. 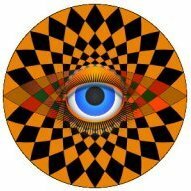 it seems that we are a bit scattered on this topic, there is another thread on the Affinity forum. We ought to show up there, so maybe the DXO team will notice that there is not only Adobe users on earth. I have tried your installation according to the screenshot you have provided and it doesn't work for me. Nik still freeze during the "preparing image" process. Have you check this really is the new version that you are running ? Sorry to ask but the first link they send to me after purchase was actually the latest free release 1.12.12 instead of the 1.12.14 paid one. They apologized for that, but first I have thought that everything worked perfectly. The solution I use for now, is to install the new version in standalone and the old one for the plugins. Oddly, when I check the version number, it shows the old plugin number with the new suite number version, e.g. 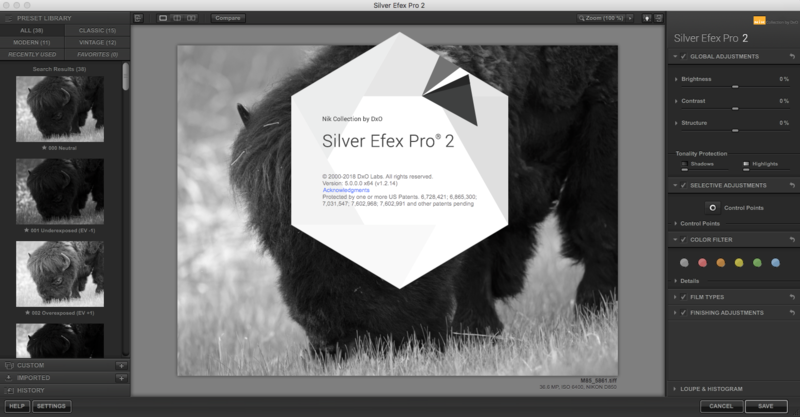 Silver Efex pro shows version 2.0.0.25 (1.12.14) instead of 2.0.0.25 (1.12.12) or 5.0.0.0 (1.12.14). yes, I got that email too saying it was the wrong link and had to download the new one, for installation of the new Nik you have to delete the old one(from DxO website troubleshooting page), which I did using uninstall from the Nik folder in the app folder, then installed the new Nik from DxO, which asked for the serial number on installation. 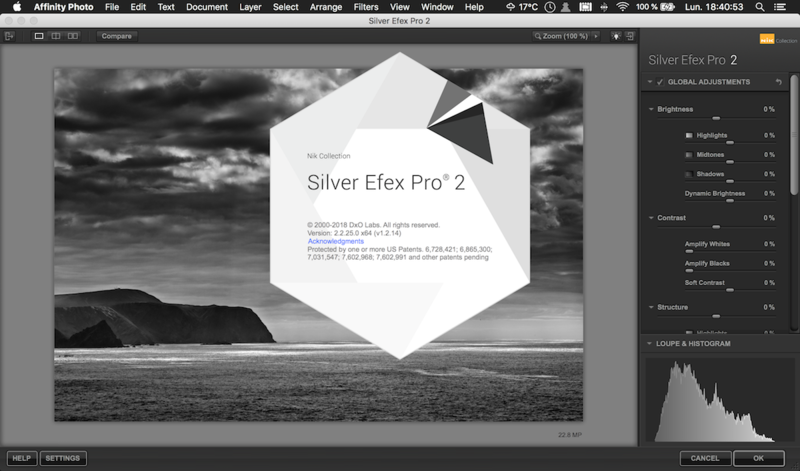 I tried sharpener pro as stand alone for the image and all I had was a blank, haven’t got time to try again but will check later to see if I still have this issue. i will try this, i still have the source of the old version. you got me thinking that I have the wrong version installed and double checked. the DxO version will show upper right corner Nik by DxO and not Nik Collection like on your screenshot. This screen is the new paid version, but in standalone version and on Mac at least, there isn't any issues running the standalone app. I have v1.2.12 running just fine on Mac, Standalone and Plugin. Hi, I removed the DXO version and installed google version but didn't appear in plugins. the installation was done in the application folder. Your plugin search folder doesn't seem to be the good one. Actually, according to your screenshot, there is twice the same path, and this is the standalone app path. 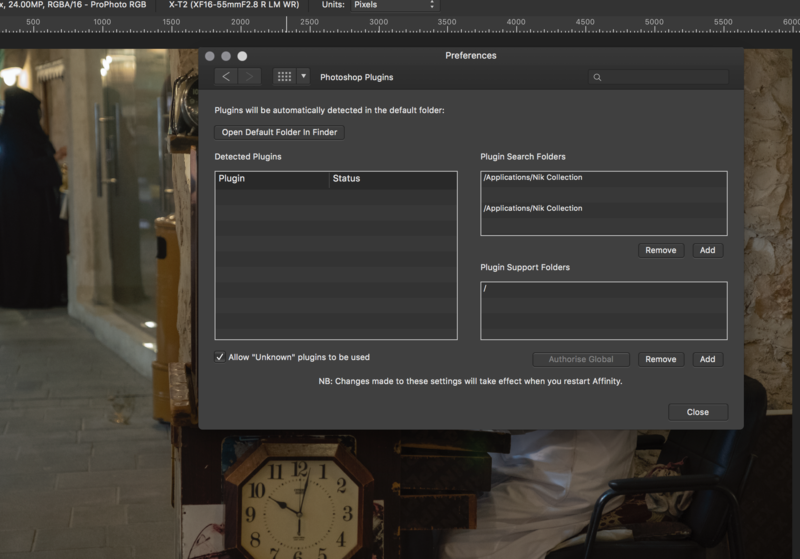 You have to change for the plugin path, wich is where you create it when the Nik install dialog box ask you for third party applications, then restart AP. Anyway, this installation is the same for any version you want to use, even the latest paid release (1.12.14). I don't think that the installation path could change anything in the plugin working. 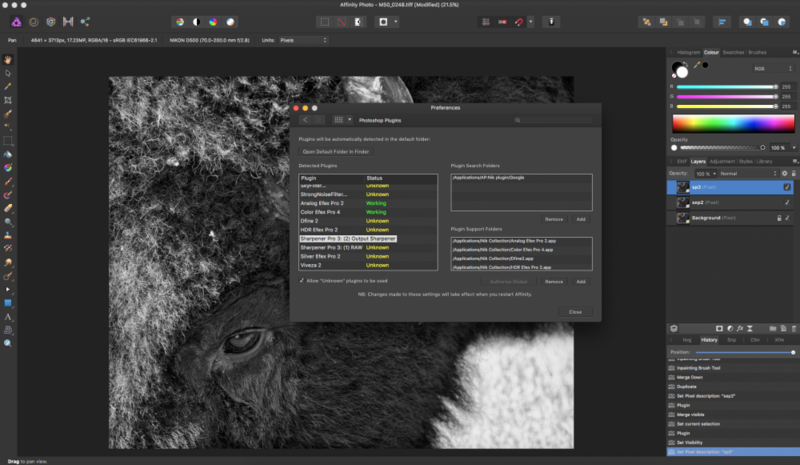 Currently several plugins of the new DxO Nik Collection seems to freeze Affinity Photo. Only the free Google version is working (with a few issues on some plugins). I'm toasted, it all freeze forced quit now using it after rebooting my computer. how could it was running on the old path but missing the old Nik which is uninstalled, not even the same plugin folder to differentiate them. not sure what I did but running as stand alone here too.